About 26% of American adults have a mental illness; however, the greatest burden is carried by the approximately 6% of Americans who can be diagnosed with a serious mental illness, the leading cause of disability in the United States. People with a serious mental illness are least likely to be working, with unemployment estimates ranging between 32% and 62% among this population. 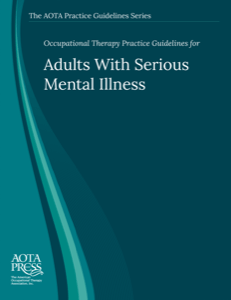 Using an evidence-based perspective and key concepts from the Occupational Therapy Practice Framework, this guideline provides an overview of the occupational therapy process for adults with serious mental illness. It details occupational therapy interventions and explains the contribution of the profession in mental health in areas such as education, work, community living, health and wellness, and cognition. The guideline includes evidence tables in each area as well as examples of diagnostic and billing coding. This reference can be valuable not only to occupational therapy students and professionals but also to consumers, consumer providers, mental health program administrators and other mental health program staff, mental health advocates, health care regulators, third-party payers, and managed care organizations.